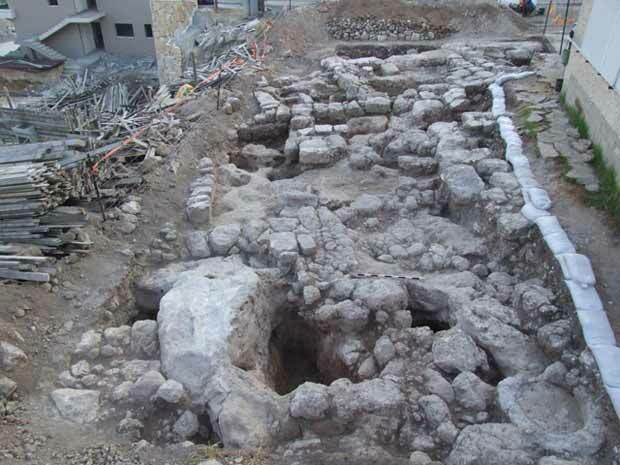 During June–July 2007, a salvage excavation was conducted on the upper northwestern slope of Ramat Yishay (Permit No. A-5147; map ref. 21550/73416), prior to construction. 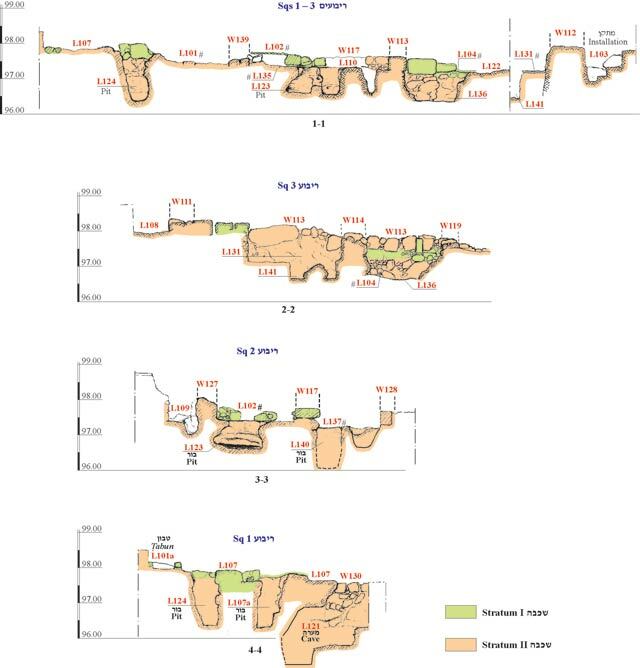 The excavation, undertaken on behalf of the Israel Antiquities Authority and partially financed by the landowners, was directed by Y. Alexandre, with the assistance of Y. Lavan (administration), T. Meltzen and R. Mishayev (surveying), A. Shapiro (GPS. ), H. Smithline (field photography), T. Kornfeld (drafting) and workers from Umm el-Fahm and Yafi‘a. Ramat Yishay is located on a limestone hill, overlooking the northwestern edge of the Jezre’el valley. Over the past twenty years, many small excavations were carried out along the hill slope in the wake of intensive modern construction. 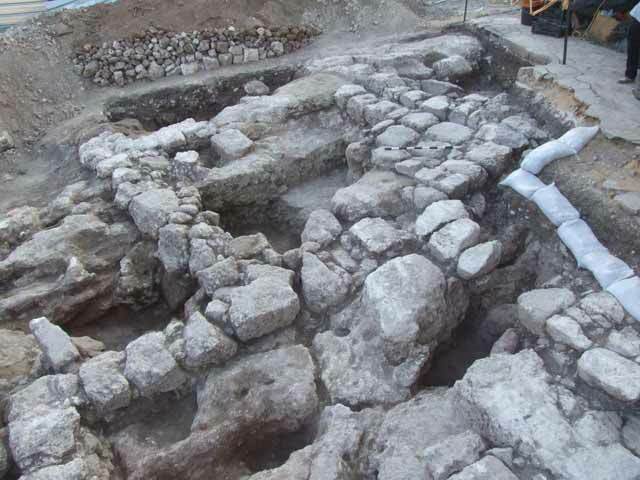 These excavations revealed architectural remains dating to the Roman, Byzantine, Early Islamic, Crusader, Mamluk and Ottoman periods (ESI 18:30; HA-ESI 117; HA-ESI 119; HA-ESI 120). 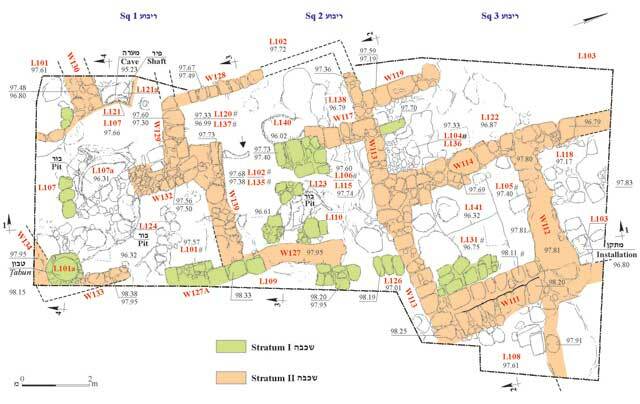 The current excavation area (10 × 25 m) consisted of three squares in a row, which was bordered on the east by a modern house, designated for demolition, and by the natural downward slope of the hill on the west. 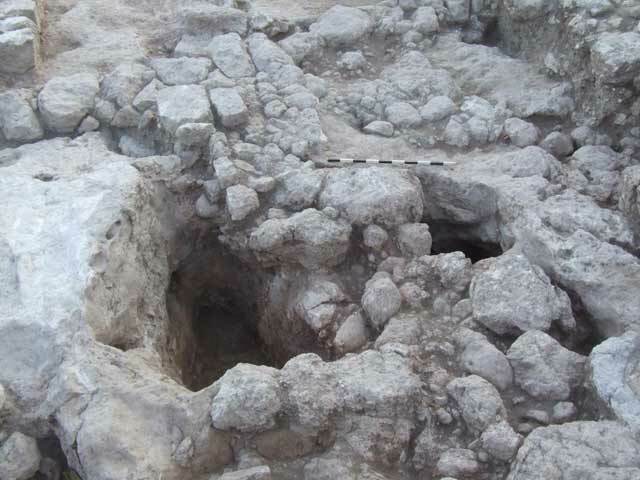 Bedrock was exposed just below surface and it was clear that remains of ancient buildings had been damaged and partially removed in the course of earthworks at the site. The extant archaeological remains comprised the base courses of walls and a few patches of floors that once formed a series of rooms (Fig. 1). Remains were uncovered at a greater depth in some places where bedrock had been hewn out in antiquity. The remains and associated finds are divided into two strata, dating to the Early–Middle Roman period (II) and the Early Byzantine period (I). Stratum II. The first occupants of this area settled on the uneven bedrock, which was extensively carved out and used as building material for construction. Several of the walls were built of large roughly-worked stones and defined a row of square and rectangular interconnecting rooms (Figs. 2–4). Only the bottom stone course of the walls was exposed in most cases; in others, the foundation course was of stones that only partially were carved out and partially were still attached to bedrock (Fig. 5). Low irregular walls of uneven width and varying state of preservation were discerned within the building. Bedrock was sometimes covered with a thin layer of packed earth that had some faint traces of plaster patches. It is presumed that the original floors of the building were of packed earth, overlying and leveling out bedrock. It seems that these were rooms and internal courtyards of a single building that must have been constructed on this level, with an extension that accommodated the natural slope, continuing down westward. Within these rooms, some cavities, pits and various installations were carved out of bedrock. It appears that some of these cavities were intentionally hewn to collect channeled run-off water, whereas others had been formed due to natural water flow and erosion. The possibly man-made pits (L107a, L123, L124 and L140) had no traces of plaster (Fig. 6). Pit 107a had an irregular shape and may have originally been part of Pit 124, which subsequently was partially blocked up with stones. A few small Middle Roman-period potsherds were discovered at the bottom of Pits L107a (depth 1.3 m), 124 (depth 1.2 m) and 123 (depth 1 m), and at a higher level, some Byzantine potsherds were found. Pit 140 was excavated to a depth of 1 m without reaching its bottom. Isolated and characteristic Early Roman potsherds were discerned at the lowest level, with some Middle Roman potsherds above them. 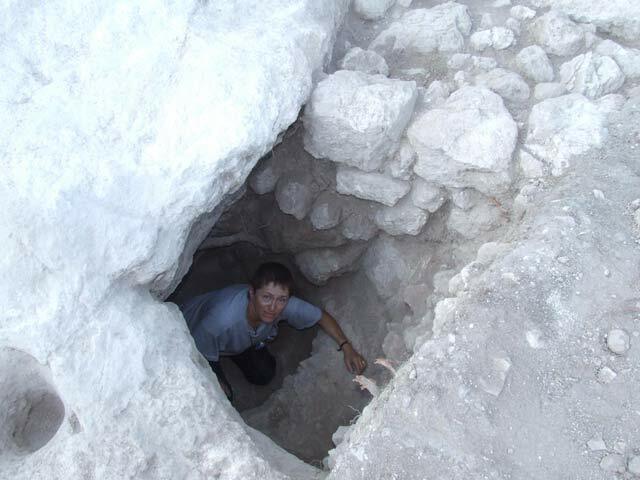 A vertical bedrock-hewn shaft (L121a; depth c. 2 m) was on the southwestern corner of the excavated area. The shaft, bounded on the south by a contemporaneous stone-built wall (W130), standing several courses high, led downward via two hewn steps into a rock-hewn cave (L121; Fig. 7). Halfway down the shaft and not on a clear floor level were several restorable pottery vessels, including cooking pots, characteristic of the Middle Roman period, storage jars and juglets. It seems that these vessels were placed in the shaft after the cave had been partially filled in. 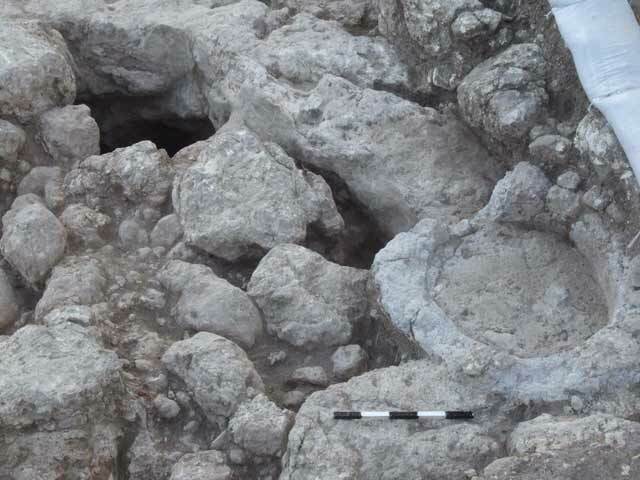 At a slightly lower level, some pottery vessels dating to the Early Roman period were found. Several of these have comparisons in the Kefar Hananya and Shikhin repertoires, typical of the Lower and Upper Galilee. Other finds included a few white mosaic tesserae, as well as a few fragments of soft chalk vessels of the type used by the Jewish population in the Early and Middle Roman periods. The excavation of the cave reached a depth of c. 2.4 m but could not be completed due to danger of the cave’s roof collapse. No bones, lamps or coins were found and it is almost certain that the cave was not a burial ground, but rather an underground chamber of sorts. Scanty potsherds of the Middle Roman period (second–third centuries CE) and some glass fragments were found on the patchy floors of the building (L135–L137). The absence of pottery dating to the Late Roman period suggests that the site was probably abandoned before the fourth century CE. Thus, a gap in the settlement was created before its reoccupation in the Byzantine period. Stratum I. 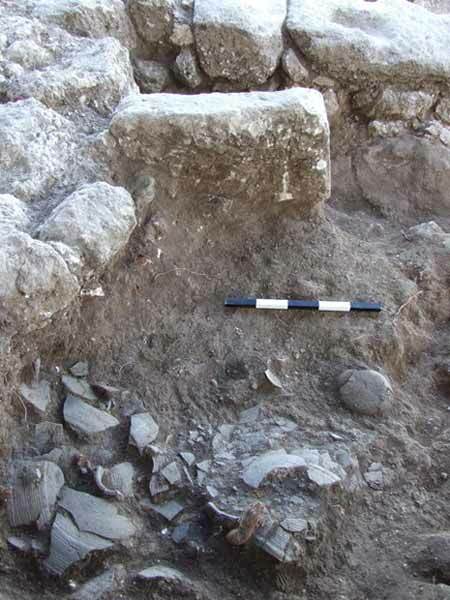 The new occupants settled between the extant walls and laid down some new floors of packed earth and many small stones (L102, L106 and L120) that were overlain with Byzantine potsherds and placed c. 0.2 m above the earlier Roman-period floors or living surfaces. Bedrock surface (L101, L107) may have been cleared and used in Stratum I. A tabun (L101a) was built in Room 101/107, partially overlying the stones of W133 and W134 (Fig. 8). Within a room (L104), a carefully hewn large rectangular stone was placed upright, forming a small partition. The floor of Room 104 was overlain with a significant quantity of ash and broken pottery vessels (Fig. 9), including cooking pots and imported Late Roman Red Ware bowls, on one of which a fragment of a cross stamp was found. This pottery, dating to the fifth–sixth centuries CE, must be associated with the end of the occupation in this stratum. Fragments of glass vessels were found in all the Byzantine-period rooms. The ash and the smashed in situ pottery in Room 104 may indicate that the occupants of the house may have been obliged to leave it suddenly, possibly due to a fire, without the possibility of retrieving their possessions. At the northern end of the excavation a rock-hewn installation (L103) may have belonged to either one or both phases of occupation. 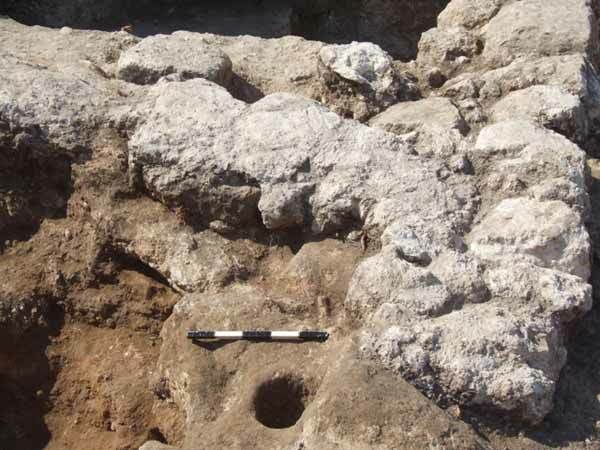 The archaeological excavation exposed evidence of a village settlement that was occupied in the Early and Middle Roman periods (second–third centuries CE), with a possible beginning within the first century CE. On the basis of the Kefar Hananya and Shikhin ceramic repertoires and the stone vessel fragments, it seems probable that the inhabitants of this village were Jewish. By the fourth century CE, this settlement was abandoned. The same house was reoccupied in the fifth century CE, with the slight raising of some floor levels. The small fragment of a cross on the LRRW bowl is a hint that the new occupants were Christians. It seems that the house was abandoned in the sixth century CE. 1. General view of the excavation, looking north. 4. Walls 113, 114, 111, 112, enclosing Room 131, looking north. 5. Foundation courses of W113 and W119 on bedrock, looking east. 6. Pits 107a and 124, with stone blockage between them, looking north. 7. The author in rock-hewn Cave 121, with W130 in background, looking south. 8. Tabun 101a, partially overlying W134, looking northeast. 9. Smashed pottery in situ on Floor 104.